You can earn 270 yards with this purchase! 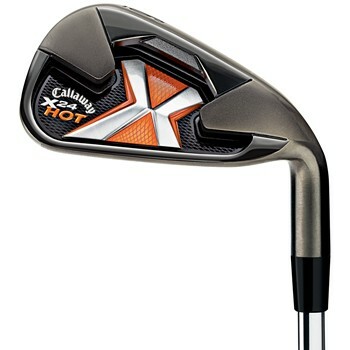 The Callaway X-24 Hot irons are the longest, most accurate X-Series iron that Callaway has produced to date. It features Variable Face Thickness (VFT) technology which provides a hotter club face with an increased sweet spot, resulting in faster ball speeds across the entire face, even on miss-hits. It also features Precision Notch Weighting which adds discretionary weight to the perimeter of the club for improved accuracy, as well as a lower, deeper center of gravity for optimal trajectory. Its dark PVD finish eliminates glare and frames the ball nicely at address.